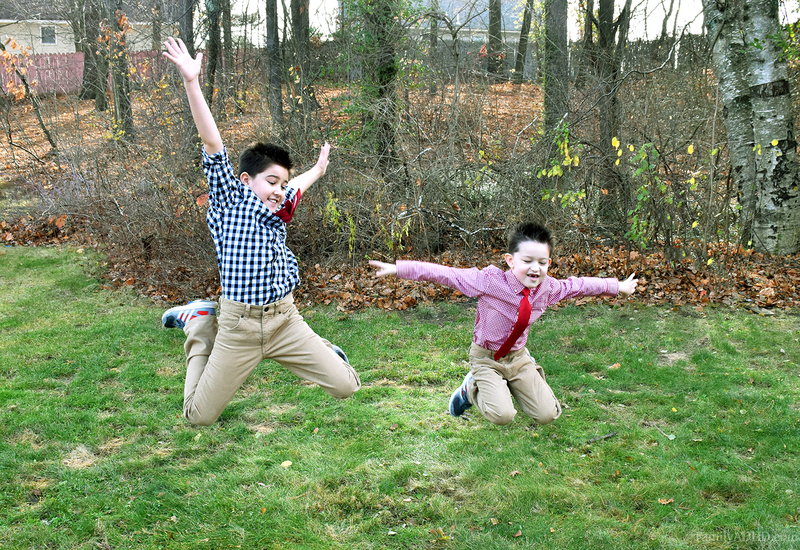 Home Blog Posts	One Big Happy Holiday Moment with Gymboree – Plus Gymboree Giveaway! The holiday season is one of our favorite times of year! While we try to make special memories every chance we get, there’s something extra magical about the holiday vibe, music and yes, even the snow come winter. Gymboree is a big fan of magical moments too and as a part of their One Big Happy campaign they aim to encourage families to celebrate special memories–big and small–and we’re happy to share a bit about that with all of you. They’ve even been kind enough to offer a fabulous prize for our giveaway at the end of this post! We have started a number of traditions over the years with our boys. I remember when our older guy was just a baby I decided right then and there I wanted to create family traditions we could continue throughout our kids’ childhoods and hopefully one day share with their kids. One of our favorite One Big Happy Holiday moments each year by far is making and decorating gingerbread houses. Every year I bake a billion pounds of gingerbread, cut out all the pieces, bake for almost an entire day, then we load them up with several tons of candy and icing. It’s so much work, but it’s completely worth it! And of course another favorite One Big Happy Holiday Moment is photographing and sending out our annual Christmas cards. Yes, I am one of those parents that dresses my kids in coordinating outfits and plasters their adorable little faces all over cards, sending them out to relatives, friends … really anyone who will get any bit of joy from seeing my little guys. 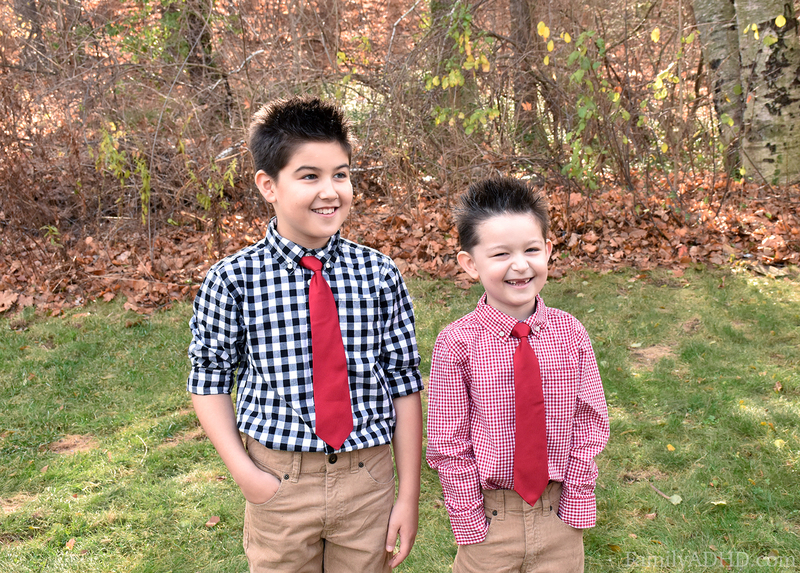 While I love dressing up my guys, it can be a challenge! In addition to having some serious sensory issues (I can’t count the number of shirts and pants that have gone unworn over the years because they literally couldn’t allow them to touch their skin for a few seconds), my youngest has some eating issues and weighs a mere 41 lbs at 7.5. It may not sound like a big deal, but he is tiny. And I mean TINY. Pants don’t fit, in fact they fall right off. Shirts are boxy and sloppy looking. I spend a lot of time scouting out clothes that won’t trigger sensory issues for both my guys while also fitting the incredibly small, thin frame of my youngest. I have to be honest, after years of purchasing, returning and pulling my hair out over trying to find clothes that work, Gymboree is one of the only brands we’ve been able to stick with. Their slim fit pants have been a lifesaver! While my youngest still has a bit of extra room, they don’t look over-sized and the fabrics are soft enough he’s more than happy to wear them. 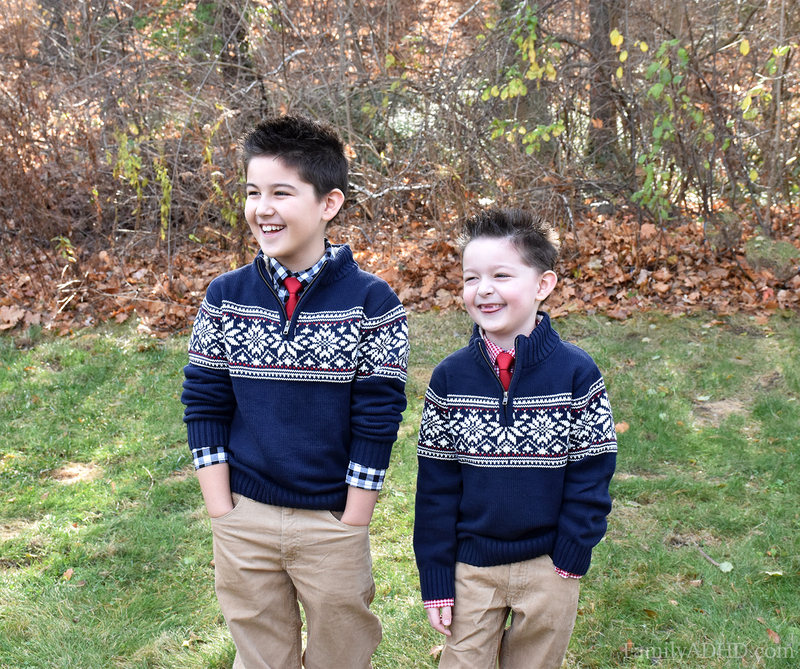 Knowing I can rely on at least one brand each year for the adorably coordinated outfits I love to put my boys in during the holidays allows me to relax a little and really enjoy our One Big Happy Holiday moments. Holiday Card & Party Ready! 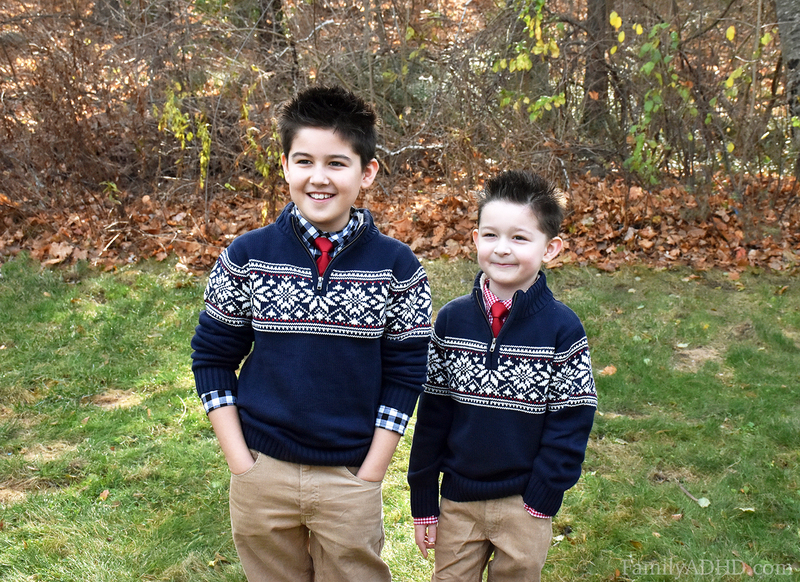 This year, I wanted to style the boys in outfits that would not only look fabulous in our holiday cards, but that they could wear again for holiday parties and church. 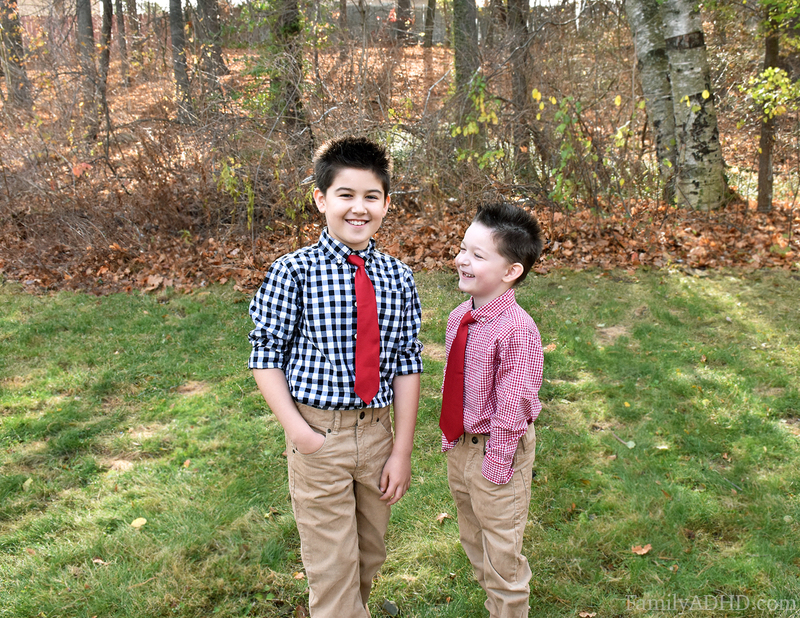 My guys are completely down with getting dressed up (offer them ties and they’re thrilled), but given the fact they both run a little warm I wanted to make sure I gave them some layers, too. Thankfully, Gymboree always has amazing variety (especially for boys) with plenty of mix-and-match pieces that come together to make the most adorable outfits! The second I saw the Sherpa-Collar Fair Isle sweater I knew it would work perfectly for us. The sherpa collar is soft as a cloud and the sweaters, like all Gymboree sweaters we’ve purchased over the years, are sturdy and soft. FamilyADHD sensory kiddo approved! While I do like to dress them in matching outfits, I like to change a little detail here or there to suit their personalities. My youngest loves the color red, so I chose an adorable red and white checkered shirt. The checkers were nice and petite and didn’t look overwhelming on his petite torso. For my older guy, I chose a black and white checkered shirt with a larger print. I love that they look dressy and comfy with or without the sweater! 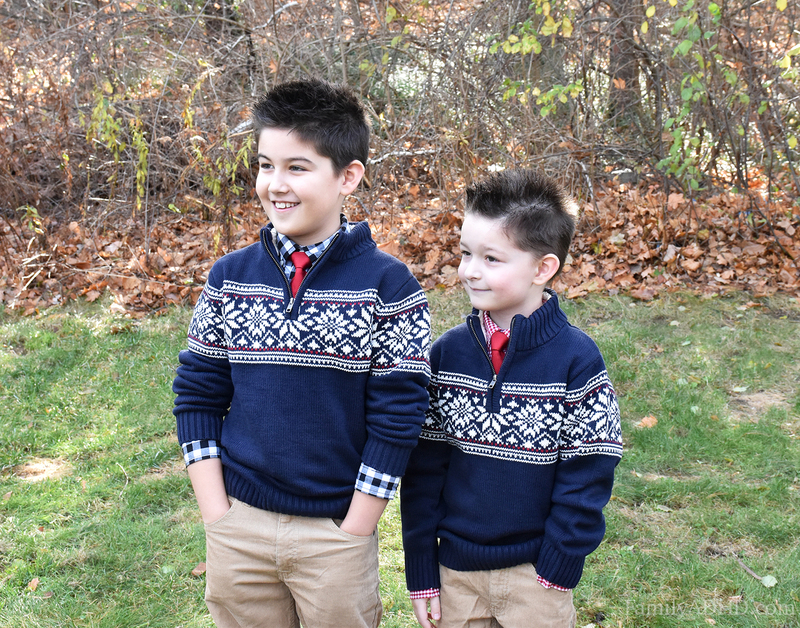 I completed the outfits with matching red basket weave ties and khaki corduroys, which my kids love. 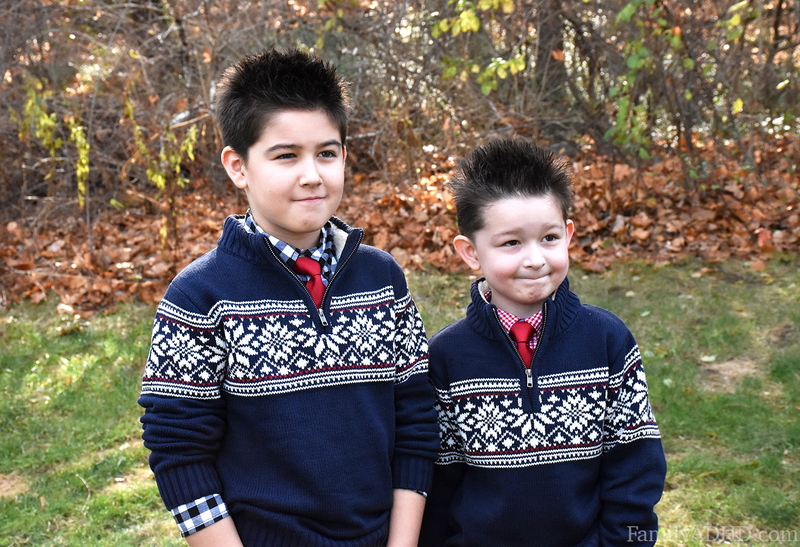 I’m happy to say they love their outfits, we got some great shots and we’re excited to make some One Big Happy Holiday Moments in these adorable looks! Now, for those of you that would also like to find the perfect outfit for your little guy to make Big Happy Holiday memories! As you can see, cute, comfy and capable of a lot of busy movement! Gymboree One Big Happy Giveaway! Dying to create the perfect outfit for your little one to create One Big Happy Holiday Moments in? Gymboree has generously offered our readers the opportunity for one (1) lucky, randomly chosen winner to win a $75 gift card! Entering is simple and can be done through this rafflecopter widget. Please note, one (1) winner will be randomly chosen at the end of this giveaway and he/she will receive the gift card directly from Gymboree within a couple weeks of the end of the giveaway. Good luck and please feel free to share! Note: Products in this post were provided by PR/the brand. All opinions are our own. The giveaway is sponsored by Gymboree. AWWW! They are too cute and I love the outfits! Your boys look so dapper! Look at them so cure in their matching sweaters! singing Christmas carols in the back of the truck while riding through the neighborhood looking at Christmas lights. This was my favorite store when Rosie was little. Loved everything in it. OMG those sweaters! How freaking cute! My favorite holiday moment was when my second son was born in December, 11 years ago. My favorite holiday moment is when my whole family gets together at my mom's house on Christmas day. My favorite holiday moment was decorating Christmas cookies with my niece last year! I've been known to go into Gymboree and buy entire collections of outfits for my kids. Their stuff is SO CUTE! One of our favorite happy holiday moments is decorating the house and tree together. One big happy we just had last weekend was getting our tree and decorating it together as a family! We really enjoy going out to the family farm to pick out a tree. Those sweaters, SO SO cute! Love the sweaters! We had a lot of fun last year with a game show that involved all families! Our favorite holiday moment Is all the kids have a new years eve slumber party and they have a Blast! My favorite one big holiday moment is driving through the Christmas lights display with my family! I like decorating the tree. We love decorating the tree, having hot chocolate, and listening to Christmas songs. We love watching classic Christmas movies and making lots of apps. We like to drive around town and look at the Christmas lights while rocking out to our favorite Christmas songs.